Let me introduce you to Rio Rita and allow this Etsy shop to transport you to the Meditteranean. Created by Irith, Rio Rita is a handmade jewelry shop specializing in one of a kind gold and silver works. What sets Rio Rita apart from others, though, is that Irith resides in Haifa near the Mediterranean Sea. Her workshop is located near the sea. The inspiration that she gets from such beautiful surroundings definitely comes across in the colors and designs that she creates for her shop. 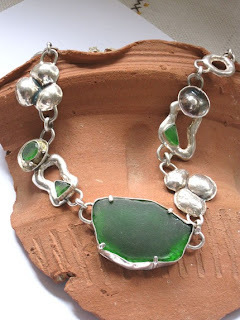 This vibrant green necklace was created from sea glass that Irith found while walking along the beach. This wiill definitely be a conversation piece. 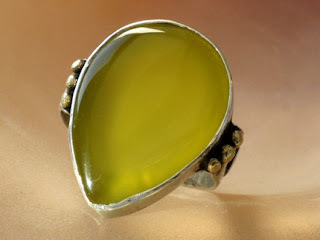 Chalcedony is said to clean impurities and have emotional, mental and physical balancing qualities. That is easy to understand, because if I were gazing at that vivid yellow all day I would certainly feel happier! This ring is also sterling silver and has 14 k gold balls on each side of the stone. So simple, yet so stylish. This sterling silver necklace features three dimensional shape with the teardrop design and flower pendant. 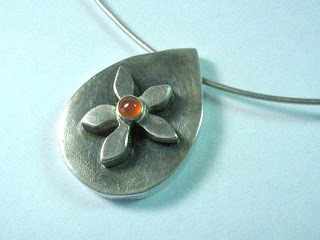 A Cornelian cabochon stone decorates the flowers center. So now that you have been transported to the sea, come back to your computer and let me show you what we have for you this week! This week our giveaway item is a beautifully handcrafted pair of earrings from Rio Rita! 1. Check out Rio Rita on Etsy. Come back here and let me know your favorite item in Irith's shop. This will get you one entry. 2. Be or become a follower on this blog and that will earn you a second entry. Entries will be accepted through Friday midnight. Come back on Saturday to see if you are the lucky winner! Rio Rita would also like to let you all know that now until January 31st all items in the shop are 10% off before shipping. Buyers will be refunded through Paypal shortly after the purchase. The designs are absolutely gorgeous, stunning and unique! I love the Square Pendant with chain, so lovely! Thanks for the giveaway. I am totally inspired. I love them all. I think the star pendant is my fav! I really love the two green pieces! beautiful!